I bought An Echo in the Bone about two years ago at Christmas, right when it first came out. 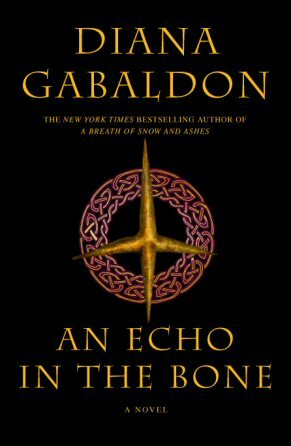 I remember how excited I was...there wasn't supposed to be another Outlander book published, so when I heard that Gabaldon wrote another, I was ecstatic. And now there's another on the horizon! This installment of what is one of my favorite series EVER follows Jamie and Claire as they attempt to make their way back to Scotland to fetch Jamie's printing press and bring it back to America. It also follows Brianna and Roger and their family, now that they've traveled back to 1980 Scotland and purchased Lallybroch. And a third storyline follows Willie, Jamie's illegitimate son and ward of Lord John Grey. I don't want to go too far into details, since doing so at all would probably lead to me giving away spoilers from both this book and the others. Suffice it to say, it was mostly more of the same - adventure on the high seas, war, espionage, love, love-making, and even a little bit of Scotland in this one! I have to say, there was a little too much Willie for me in this novel. The previous books didn't really delve into Willie's life or experiences, so I felt like I didn't really know him, and it was a bit difficult to get used to reading about him now. And most of his storyline was about his wartime role in the British army, which alienated me even further. But I got used to it in time, and that plot actually dovetailed with the others eventually, so it made more sense once I saw how it played into the other plots. Four out of five Whatevers. Fewer Whatevers than I would otherwise give it, due to the slow Willie parts and the damned cliffhangers! Now, I can't wait for Written in My Heart's Own Blood to come out. 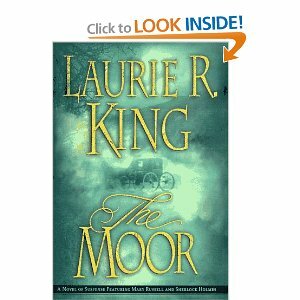 This cover is not exactly the one on my book...mine is black, with gold writing, with a gold oval around the carriage from this pic. I believe I Mooched my copy. I finished the book about 12:15 am on Jan. 1, so according to Wendy, this counts for the Merely Mystery reading challenge! I loved the first book in this series, but then only liked the two after it. I'm happy to report that this installment of the series was a return to the quality (for me) of the first one. I quite enjoyed it. It may be that it's because there was almost no mention of theology in this one. I really think that the theology was what bogged books two and three down for me. In this episode, our intrepid heroes set off for Dartmoor, called in by Sabine Baring-Gould (who turns out to be Holmes' godfather) to solve a mystery that has haunted Holmes before. The moor folk (and others) have reported seeing a mysterious hound stalking the moor. It is following a carriage which the locals believe to be made of the bones of Lady Howard's dead husbands. Could it be that the Hound of the Baskervilles has returned to walk again? When people begin to show up dead on the moor, Baring-Gould calls in Holmes and Russell to get to the bottom of things. This was just a good old-fasioned mystery. I really, thoroughly enjoyed it. I'd give it four and a half out of five Whatevers. Recommended for fans of Holmes (or Russell), for fans of mysteries, for fans of English history. 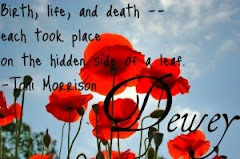 I love this series and will be continuing on with it this year! Wendy at Musings of a Bookish Kitty is hosting the Merely Mystery Reading Challenge. Participants can read at one of two levels: Down on Her Luck Gumshoe (two or more books from one mystery subgenre) or Shamus Who Has Seen It All (one book from each of the 12 subgenres). I don't usually go in for reading challenges, but seeing as it's Jan. 1 and I've already completed half of the Down on Her Luck Gumshoe level (maybe it's cheating, but I finished a mystery at 12:15 this morning! ), I figured I'd join up. I plan on finishing several more mysteries this year, anyway, so even if my early morning finish doesn't count, I should still easily complete the level I've chosen. Head over to Wendy's post to sign up!